Is Nancy Travis Lesbian ? Nancy Ann Travis is an actress of American nationality known for appearing in several movies and television shows. She is best known for portraying Sylvia Bennington in the movie, Three Men and a Baby. She currently working in the ABC sitcom, Last Man Standing. The beautiful actress, Nancy Travis was born on September 21, 1961, in New York, US. She was raised in a Catholic family to Theresa and Gordon Travis. Her nationality is American and belongs to the white ethnicity. Travis completed her graduation from New York University. She got her first job after at The American Jewish Theater in NYC after which she hit the road of acting. Later, Travis appeared in various stage programs and dramas which helped her to nurture her acting skill. In 1985, Travis made her debut on television in 1985. She portrayed Ann in the TV film, Malice in Wonderland and her performance was loved and appreciated by every audiences and critic. Travis made her movie debut in 1987. She played the role of Sylvia Bennington in the movie, Three Men and a Baby and later worked on its sequel too. Besides, Travis has done a numerous movies such as; Married to the Mob, Eight Men Out, Fallen Angels, and Almost Perfect. She has worked on several TV series like Spencer: For Hire, Fallen Angels, Duckman, Almost Perfect, and Superman: The Animated Series. In 2011, she joined the cast of ABC sitcom, Last Man Standing. She portrayed the role of Vanessa Baxter in the series. The Last Man Standing fame actress is a married woman and has two children. She tied a knot with Robert N. Fried, the founder & CEO of Feeln in 1994. The personal life of this beautiful and talented actress has been well covered by numerous news, tabloids around the world. She seems to be devoted to her husband and doesn't seem to be under any marital problems that might lead to a divorce. The couple is together for last 23 years and has two sons; Benjamin (born on 1998) and Jeremy (born on 2001). Nancy is living a happy and prosperous life with her husband and children in their grand mansion in New York. In 2007, she starred in the short movie Sally, featuring his elder son and written by her husband. Star Cast = Mel Gibson, Robert Downey Jr.
Age: As of 2018, she is 57 years old. Height: She stands at a height of 5 feet 3 inches (1.62m) tall. Weight: She weighs 142 lbs (64kg). Robert N. Fried, who is the founder of SpiritClips.com, is the spouse of Nancy Travis and they have been together since 1994. Benjamin is the first son of Robert N. Fried and Nancy. He was born healthy and is in his teens. 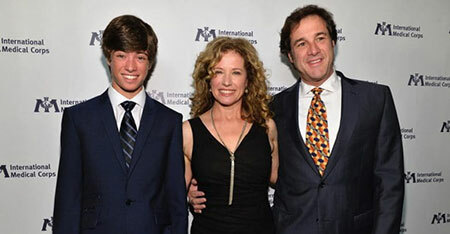 Robert N. Fried and Nancy have a second son Jeremy. He is very cute and in his mid teens.